Aamir Khan gets ready for a milestone birthday. Unlike every year, Aamir Khan invited the media to his home a day before his birthday. The actor, who will turn 50 on March 14, thanked the media who he said, "give me so much love. I feel very special." Known to be a workaholic and a fitness freak, the actor said he had taken a holiday from both on his birthday. "I spent time with Azad. I will leave shortly because Kiran has organised a surprise for me. I don't know what it is, but I am going," he said. 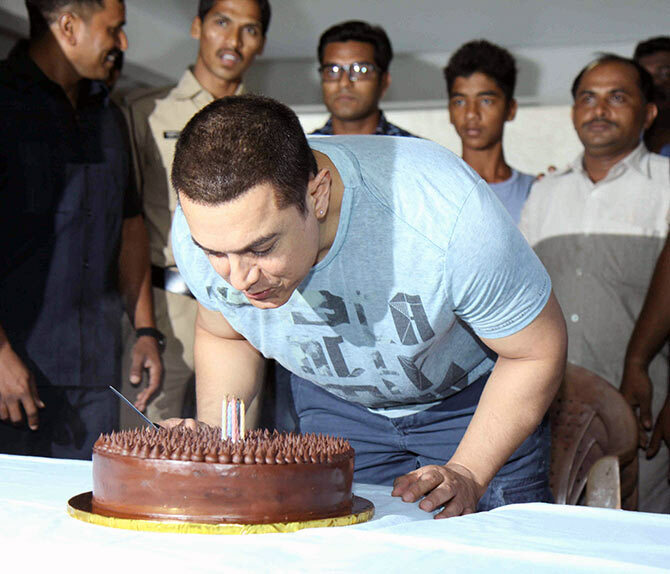 For his three-year-old son Azad, the only interesting thing about the birthday is when he gets to cut the cake, Aamir said. Aamir's birthday celebration when he was a child, the star recalled, always got postponed because it came in the middle of exams. His most memorable birthday gift was a kite. "I loved kites, so on my birthday I got lots of kites, manja and charka, and that made me very happy." He never does anything special on his birthday; in fact, he says, "I get embarrassed on my birthday. His cousin Mansoor Khan had said that birthdays for the Khans, during their childhood, meant chutney sandwiches and cake, and that's it. "Some people are very happy on their birthday as it is a special day for them, but some people are very shy and don't like the attention they get. I am like that. I don't like all the attention on my birthday." About turning 50 he says,"I don't feel like a 50 year old. Forget 50, I don't feel like 40! I have still not reached 22." "Fifty is just a number. I feel all of us mature at the age of 18 or 20. Most people get stuck at that age in their minds. Physically we may be growing, but emotionally and mentally we are stuck at that age." "When I see someone I think of them as aunty and uncle, I forget I am the same age, because in my mind I am still 18." Aamir says you remember your age when you have to do something physical and can't do it as easily as when you were 18. "Otherwise, at heart, all of us are young." Looking back on his 25-year film career, he said he was fortunate to be able to do the work he liked. "This industry is very special; there are so many talented people I share the space with. I am grateful to writers and directors who wrote special films for me." "How well a film does is not in our hands; but the work we have to do, that is in our hands. I say I am fortunate to have got the work that I wanted to do, but the truth is that I fought for that work." "I went against the tide to achieve my goal." "I am happy I have always listened to and followed my heart." "I did not do logical, practical, tactical things; I only did things that gave me happiness." "I struggled to do the kind of work I love to do, and fate has also helped me a lot," he acknowledged. There have been failures, but he sees them as "stepping stones to success." "At the beginning of my career, I did some films that did not work. I did not do good work myself, some choices I made were wrong, but I learnt from all my failures. Failure taught me what not to do and what to do." The three Khans who dominate the film industry all turn 50 this year. Asked which of them looks younger, Aamir said, "All three are young; all of us are '65 born, so we will all be 50 this year." Image: Jackie Shroff, who lives in the same building as Aamir, came in to wish the actor.. He spoke briefly about his forthcoming film, Dangal. "I am learning wrestling for Dangal. I am trying to understand the Haryanvi accent. The shooting has been pushed to September." "The physical transformation required at any age is difficult, but it is tougher the older you get. But it is our job. I am sure it will take a toll on me, but I don't know how yet." He weighs 90 kilos in preparation for the film and is looking the way he wants to for the role. "If you are strict and disciplined about it, you can transform your body. I have done that many times, it is very scientific." Barring Ghajini, Fanna and Dhoom 3, his other films, Lagaan, Dil Chahta Hai, Rang De Basanti, Taare Zameen Par or PK are very different, but they do better business, he said. "Dangal too is a different film. I am excited about it. I don't think of commercial success. I do a film because I like it. I like to surprise myself with my films." He doesn't like watching his old films because "I can see all the mistakes that I made, the things I could have rectified." 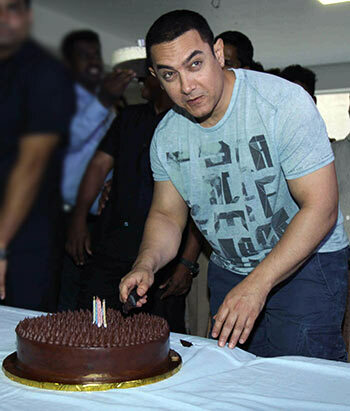 Image: Aamir Khan cuts the vegan cake which has no milk and egg in it. He has turned vegan and the cake he cut has no milk and egg in it. "The reason I became vegan is because Kiran showed me a video on YouTube on good habits and good food by an American doctor. I realised that a vegan diet was the best. I tell everybody to turn vegan." A vegan diet is inexpensive, he said, because you don't eat any meat, and give up all milk and dairy products like yogurt, cheese, butter, paneer. With the Censor Board being under scrutiny, Aamir said the name Censor Board is wrong. "It is actually Central Board of Film Certification. It doesn't censor, it just certifies. It is not allowed to censor anything." "We should discuss this topic vibrantly. We should protect freedom of expression, it is our fundamental right." "I am against banning films. I feel freedom is important, but with that comes responsibility." Aamir said he is quite impressed with Jain philosophy because "it is based on three aspects -- non-violence' only use things that you require; and you don't fight with people who have a different opinion." Take this Aamir Khan Quiz NOW! Aamir, Clooney, Anil Kapoor: The HOTTEST star at 50? VOTE!